After all the hot, bright colours of my posts on Vietnamese crafts, it is time to return to the soothing lure of white on white. I would have had this finished before Christmas except that the design suddenly began to pull me in a direction I hadn’t anticipated and as time seemed to plummet down a black hole, the work was put to one side. 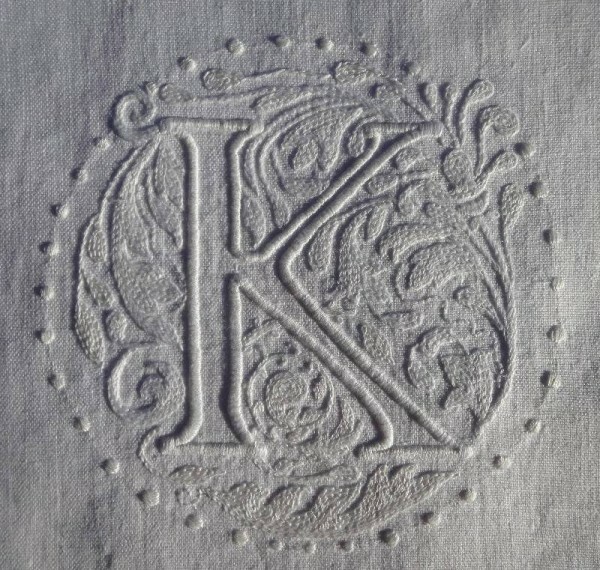 I have long felt that I wanted to embroider a William Morris style capital letter but when I researched the subject further I realised that I didn’t want to do anything quite so chunky and heavy – I’ll save that for another time when I’ve set myself up with off white crewel wool and knobbly unbleached linen (there, now I’ve got myself really excited at the prospect). 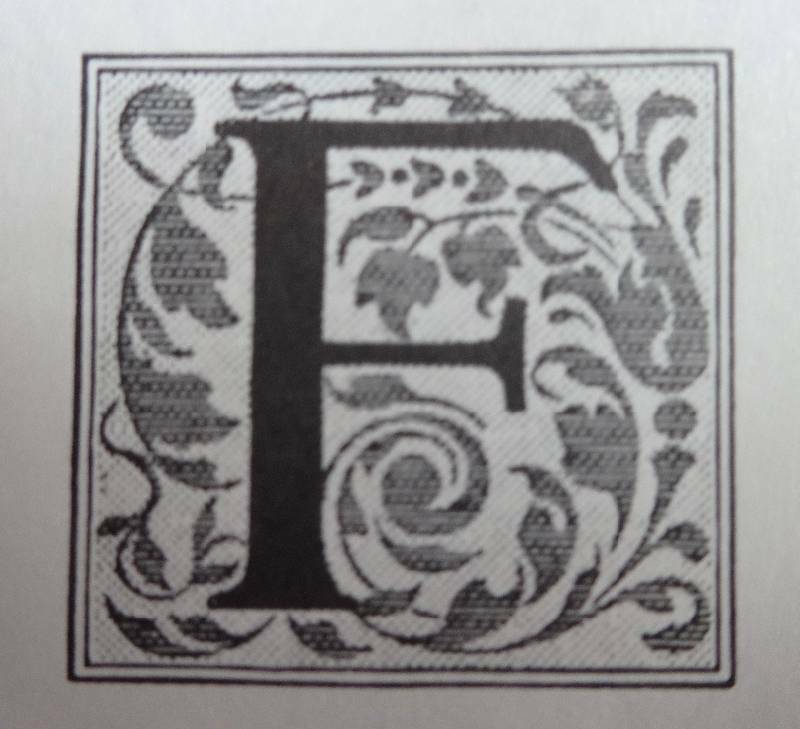 Meanwhile, one of my Dover books (Historic Alphabets and Initials: Woodcut and Ornamental; ed Carol Belanger Grafton. Dover 1977) came to the rescue and presented me with a lovely C19th German alphabet, which was itself based on C16th Renaissance models. 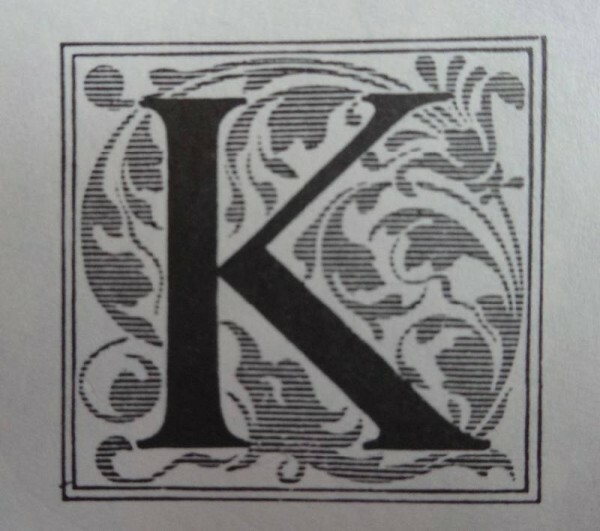 Well, we’re all mongrels now and what was William Morris doing but trawling back through history to the early years of wood engraving and the model of William Caxton. I looked at the F and the K and then took from each the features I liked best. Then as I was nearing the end I realised I didn’t like the whole circle being enclosed in a square concept and decided to go all out for the circle. 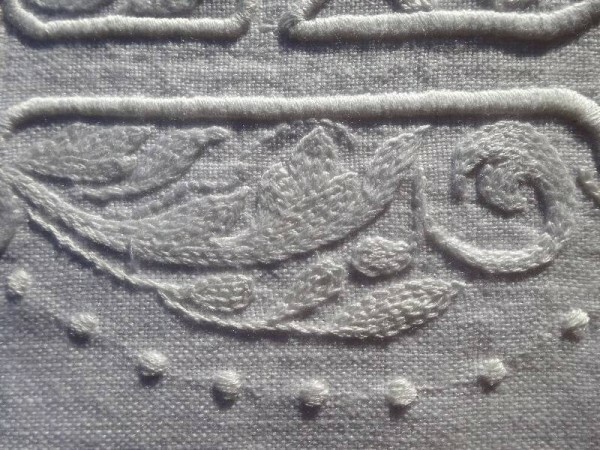 This involved a bit of additional embroidery in the form of the odd curving leaf and tendril and a final outer ring of embroidered dots to pull the design together without fencing it in. 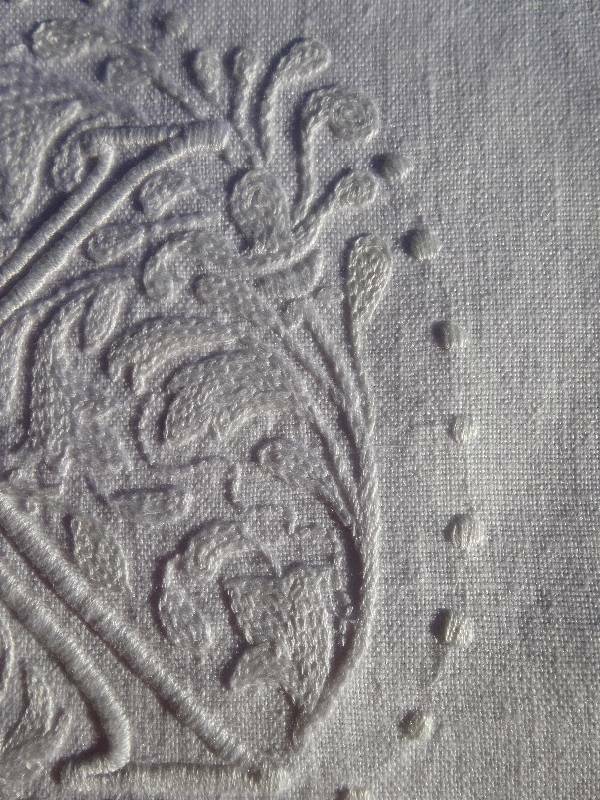 I used DMC Blanc on white linen and once again my not making a note of what I am sewing with has caused me problems. The 6 or so shades of white that I regularly use are all clearly distinguishable in daylight but at night even with a very good sewing light, they become indistinguishable. 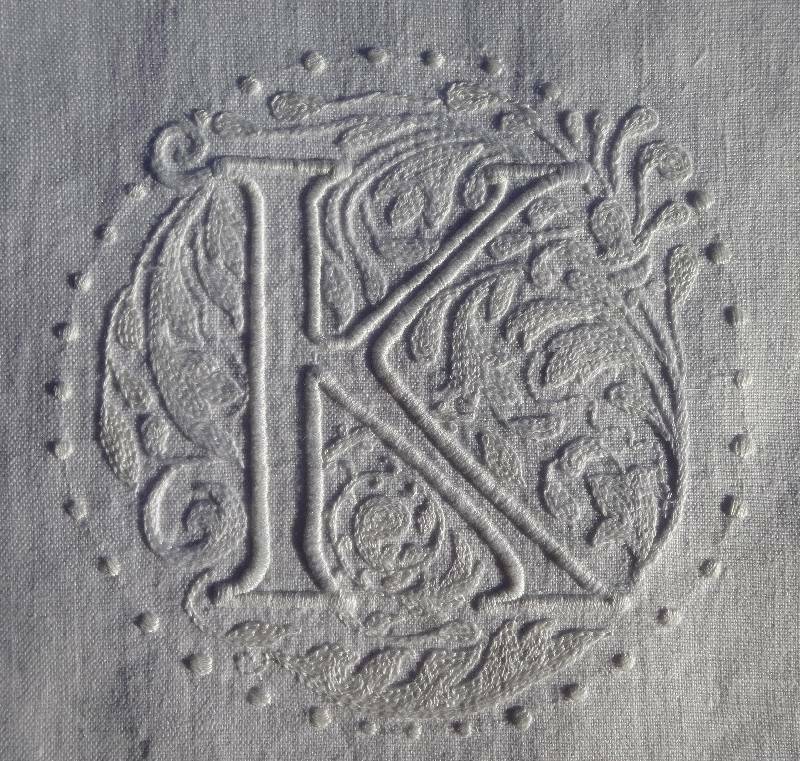 In fact this ended up not being a problem as I had only used the wrong thread on the outline of the K. Going over this with another layer of satin stitch was great as it gave the letter greater definition which I liked. I hope I’ve finally got the message that I must always make a note of which threads I’m using – in winter as I’m away from home Monday to Wednesday, I won’t even discover any mistake made on Sunday evening until Thursday morning and there are too many evening’s work to lose in that time. Stitches used: satin stitch for the letter K and the circle of dots; chain stitch for the flower and leaves. 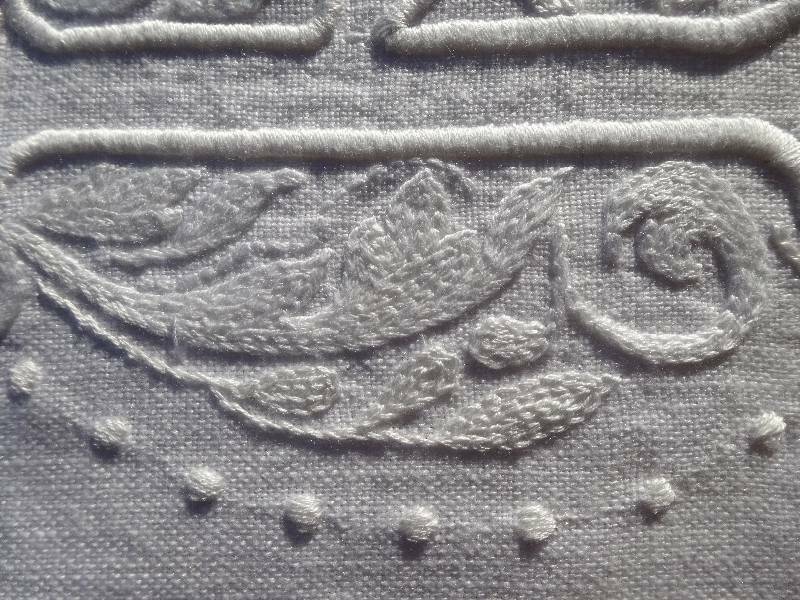 If the chain stitch were in wool rather than cotton it would be called crewel work. When I have made this up into a cushion, I shall add a picture of the finished item to this post. I wonder if you could recommend some embroidery books for me. I need one with good descriptions or photos / diagrams of the different steps. Thanks in anticipation. Love reading your blog and seeing your lovely work. It’s very kind of you to leave such a lovely comment, Karen. When I first began to embroider I just threw myself into it and played around with scraps of fabric. Just have a go at drawing a design out and adding some stitching. There are lots of lovely new books in the shops in the UK but the one I do turn back to is very old and can often be picked up for very little secondhand – I have mentioned it in my blog previously, though I can’t remember where. By Thérèse de Dillmont, it’s called The Encyclopedia of Needlework. There is no publisher but at the top of the title page it says DMC Library. I will look around and see if there are others that I am impressed by. Thank you so much Mary. I looked online for the book and it is available as an egutenburg project – meaning that it is freely available to read. I will try to purchase one. I learnt to sew at school but am really a novice when it comes to embroidery. Wonderful embroidery. Your idea to replicate in white on white is a terrific way to use the designs. I have just finished a wholecloth white on white quilt, never again How did you SEE to stitch so perfectly. Found your blog spot while reading Barbara Brackman’s blog. Thanks for posting your blog address. Well done for finishing your tablecloth. 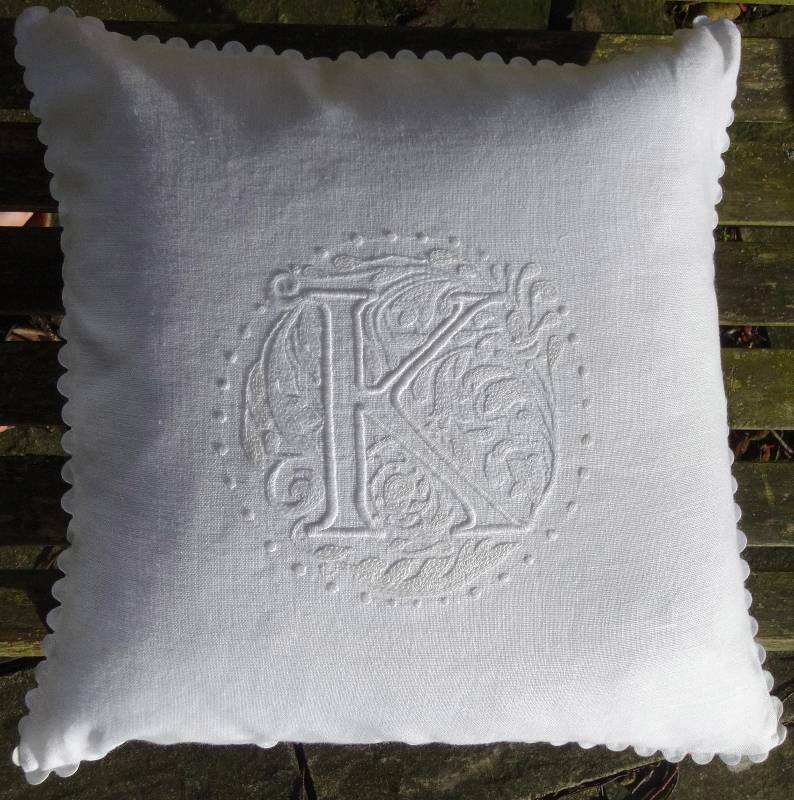 Now you can do the odd monogram and enjoy a smaller white on white project. Thanks for visiting my blog and leaving a comment. What beautiful beautiful work. I wonder whether you ever accept commissions for this type of work – it’s exquisite and I would love to order some for a friend – could that be possible? Sasha, Thank you for your interest in my work. I charge £150 per cushion. Hand work in England is very expensive – we are very spoilt by imported hand embroidery selling what to me is ridiculously cheaply. 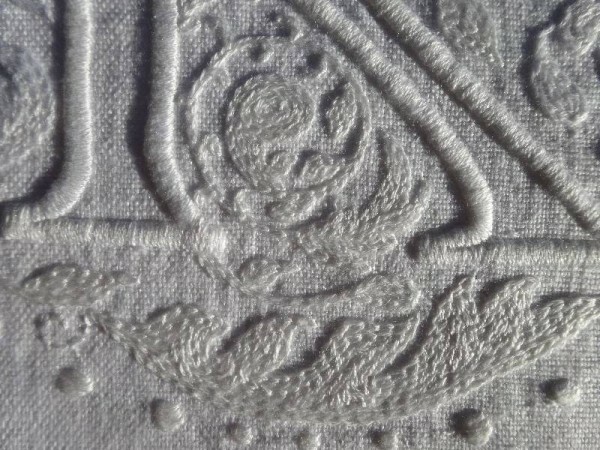 Each of my embroideries is unique and requires time for thinking about the design and then 3-5 days to embroidery.